Below are our sample song lists. This list does not contain all of our current songs – we have many more and continue to add new material! The Kathy Ford Band has been one of the premier bands in Michigan for over 20 years. Their musical mix includes current favorites, Jazz, Rock and Roll, Disco, Blues and Country. Each year the Kathy Ford Band is busy performing at fairs within the state; they have performed at The Michigan Festival in East Lansing, the Rib Festival in Kalamazoo, the Balloon Festival in Battle Creek, the Taste of Kalamazoo in Kalamazoo, the Allegan County Fair, the Western Michigan Convention and various nightclubs and private parties, just to name a few. 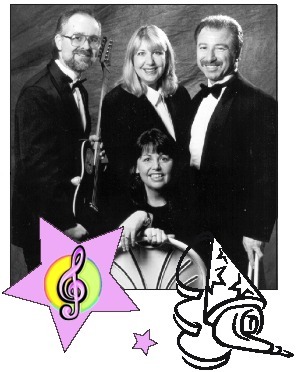 The band consists of four main members: Kathy on lead vocals, piano and guitar. Bill Fuller on lead guitar, Elayne Schroeder on lead vocals and bass and Mike Rosetos on lead vocals and drums. The band prides itself on having a very tight sound, rich harmonies and a professional attitude. Recently, the band has been busy with recording – and maintaining a large mailing list throughout Michigan. Additionally, the Kathy Ford Band has been named “Best of the Best” for the past eight years by Lansing State Journal readers. The band has performed for several dignitaries including the President and First Lady Clinton, Governor Ann Richards of Texas, the Governor of Michigan, Senator Debbie Stabenow, as well as at several corporate parties and events.